LAS VEGAS – August 16, 2018 – Barrett-Jackson continues building an impressive docket with 15 cars from the John Staluppi Jr. Collection that will cross the block during the 11th Annual Las Vegas Auction, September 27-29, 2018, at the Mandalay Bay Resort and Casino. Among the feature vehicles in the collection are an Elvis Presley-owned 1971 Mercedes-Benz 280SEL (Lot #725), purchased new by “the King” and retained through his death, and a 1957 Chevrolet Bel Air Custom Convertible (Lot #724) with a frame-off rotisserie restoration completed in 2015. 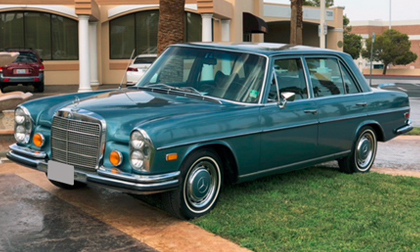 The Elvis Presley ’71 Mercedes (Lot #725) has a fuel-injected 169.5ci 6-cylinder engine and is equipped with many options, including power brakes, power steering, power windows and air conditioning. The vehicle went from Presley’s garage to a museum, where it has been on display for 40 years, and is accompanied by documentation from the purchase, along with a photograph of the car in front of Graceland. Lot #724, a ’57 Chevrolet Bel Air Custom Convertible, features a complete frame-off rotisserie restoration finished in December 2015. It is powered by a brand-new Chevy Performance 430hp 6.2-liter LS3 engine mated to a 4L65E automatic transmission, and sits atop an Art Morrison chassis with RideTech adjustable coilover suspension. Also among the top cars from the collection is a 2017 Chevrolet Yenko Camaro (Lot #723), one of just 50 Limited Edition Yenko Camaros built for 2017 by Special Vehicle Engineering (SVE). The special package pushes the car to 800hp and 750 ft/lbs of torque from its 455hp LT1 engine. It is documented extensively and has just 236 actual miles. Dodge is also well-represented in the collection, including a 1969 Charge Custom HEMI Coupe (Lot #722), upgraded to a fresh hydraulic roller real 426ci HEMI that has been paired up to a built 727 automatic transmission. A Hotchkis TVS system has been installed, including Fox tuned shocks and HEMI torsion bars, and the HEMI coupe is also equipped with Wilwood brakes all around. The 2018 Las Vegas Auction Preview Docket is now live. Advance tickets and All-Week ticket packages are also available at Barrett-Jackson.com. Consignments are being accepted for the 2018 Las Vegas Auction; to submit an application, click here. For information on becoming a bidder, visit www.Barrett-Jackson.com/bid. Also, follow Barrett-Jackson on Facebook, Instagram, LinkedIn and Twitter for the latest news and information heading into the 2018 Las Vegas Auction.